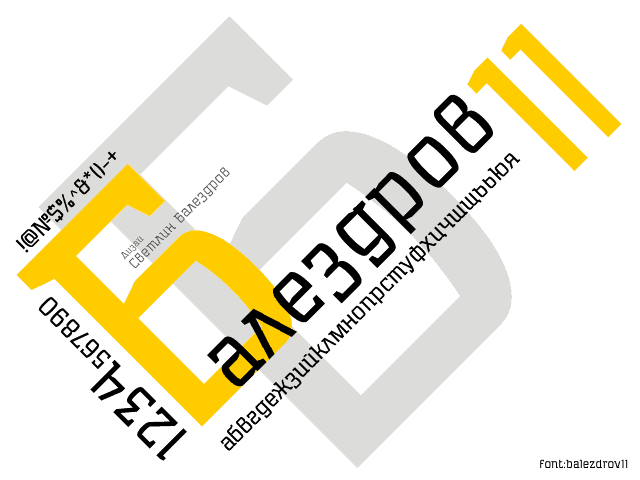 Balezdrov11 is a font which does not imply universal applicability like Неlvеtіса for example, but can be used in many forms of graphic design, depending on the imagination of the designer and his typographic skills. More restricted use of Blaezdrov11 is destined from the specific of its structure. Its prevailing rectangles on which are subordinate even the oval letters, helps to create uniform type of picture. And to avoid monotony and to maintain the relative variational forms, diagonality beams are not converted into verticals or horizontal ones and and thus they bring the necessary diversity. The main architecture on the letters is augmented c selectively placed serifi of contributing to the achievement of inner harmony and balance of the letter thus the architecture gives completeness of form.